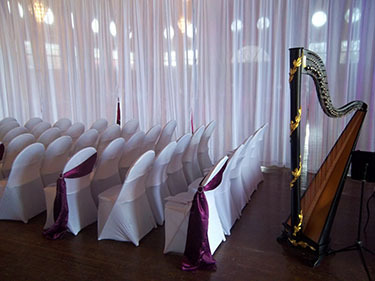 As a professional harpist, I have two decades of professional experience providing harp music for all types of events, in venues ranging from backyards to palaces, and across four continents. As a harp soloist or in the ensemble of your choice, I play elegant music for weddings, corporate events, parties, memorials, and other events through the Midwest and beyond. No matter the type, style, or size of event you envision, I am happy to work with you to make the music fit in perfectly! Contact me for availability and a quote.